What are yurts? - lots of information about Mongolian Yurts - DEVON YURTS Glamping in Style! A Mongolian yurt is a unique structure that can be used for various purposes. They are a perfect example of a space that feels both permanent and secure, yet can still be moved easily, with little or no impact to the environment. There is something very special about stargazing through a yurt’s roof crown on a summer’s evening or stoking the wood burner, warm and cosy on a winter’s day. Certainly a yurt will evoke the romantic nomad in all of us. 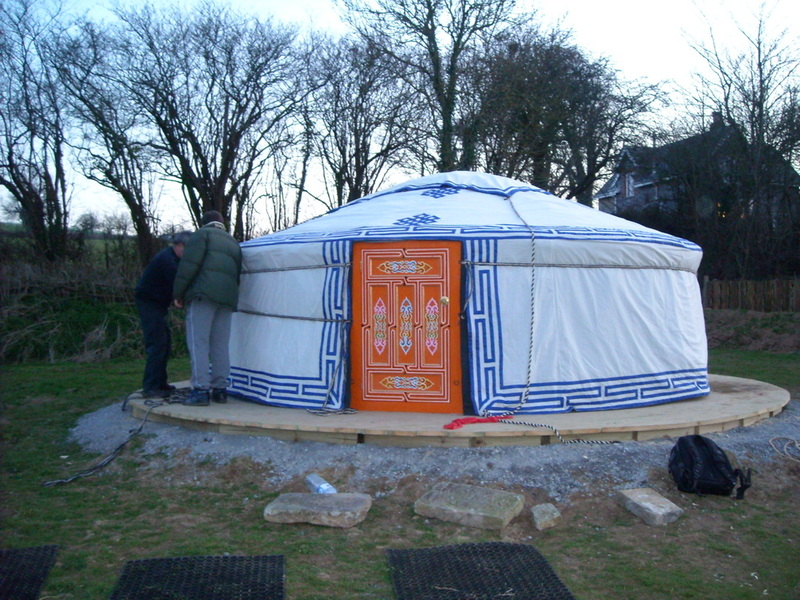 The word yurt is originally from a Turkic word referring to the imprint left in the ground by a moved yurt. The term came to be used in reference to the physical tent-like dwellings only in other languages. In modern Turkish the word "yurt" is used as the synonym of homeland. In Russian the structure is called "yurta" (юрта), hence the word came into English. The yurt wall frame is made up of several flexible lengths of trellis. Each trellis section is a pattern of crossing wooden laths. These are bound together by a number of encircling bindings that create a cylinder that can vary from 3 metres to 10 metres and is about one and a half metres in height. The door frame is set between two wall sections. The roof wheel or crown, which is between one and three meters in diameter is morticed radially with slots/holes to receive the roof struts support the wheel’s separate felt cover. A set of curved struts, each about two and a half meters in length, which span the space between the top of the trellis wall and the rim of the above-mentioned roof wheel (which is customarily suspended some three metres above the level of the floor). Once erected the yurt frame is covered with pieces of felt which are strapped in place. In many cases canvas is used to cover the felt and on top of this a cotton sun top may be added. The frame is tied together with one or more ropes, webbing or straps. The shape of the yurt roof varies regionally - in Mongolia they have, almost exclusively, a conical shape with straight roof poles. Central Asian yurts roofs are normally curved giving more domed shape and use bent roof-poles.